On December 5, 2007, Sotheby’s New York will have the privilege of offering for sale one of the last known masterworks from the dawn of civilization remaining in private hands – The Guennol Lioness. 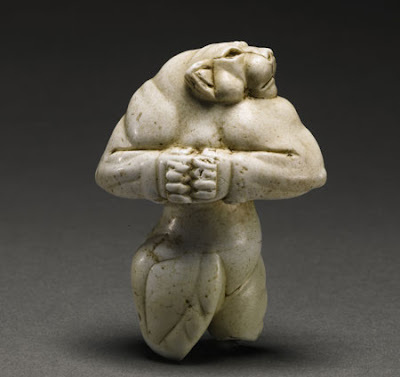 Exhibiting strength, and with an expression of focused determination, this powerful and finely carved figure of a lioness was created approximately 5,000 years ago in the region of ancient Mesopotamia. Its creation was contemporaneous with the first known use of the wheel, the development of writing, and the emergence of the first cities. About 3 ¼ inches in height, the white limestone sculpture was acquired in 1948 by Alastair Bradley Martin and his wife Edith, whose revered Guennol Collection of choice masterworks across countless periods and cultures has been celebrated by scholars and museums for decades. The Guennol Lioness has been on view at the Brooklyn Museum of Art for nearly 60 years and extensively published. Diminutive in size, but monumental in conception, this icon of Near-Eastern Ancient art is estimated to sell for $14/18 million. The proceeds of the auction are to benefit a charitable trust. (Approximate Size, 3 ¼ inches). The Guennol Lioness is a tour de force in limestone that was probably a symbol of power and owned by a figure of great importance. The commanding figure stands with her head turned over her left shoulder; paws forcibly clenched in front of her muscular chest. Despite her relatively small size, she conveys an unmistakable impression of monumentality. Noted scholar Dr. Edith Porada has described the Guennol Lioness as “a unique and remarkable example of Ancient Near Eastern sculpture.” Referring to its presence, she commented, “Perhaps the most striking feature of this sculpture is the impression of monumental power which it conveys. When seen in the original, the figure seems to fill the entire field of mental vision; even in photographs it gives the illusion of considerable size.”1 Although scholars have had access to this object for nearly 60 years, its identity, role within the system of beliefs, mythology, and the rituals of the culture that produced it, will probably remain a matter of speculation. However, the fierce aspect of the beast and the power it emanates could provide clues to the nature of the object, which perhaps was meant to repel misfortune and keep malevolent forces at bay. The Guennol Lioness was created 50 centuries ago, in the region of the world that gave birth to writing, currency and urban centers. Based on a strong connection to a series of seal impressions featuring a striding upright leonine beast with paws locked in front of the chest, the Guennol Lioness is thought to originate in Elam, part of the cultural region of Mesopotamia. The figure is reported to have been found at a site near Baghdad, according to Joseph Brummer, the renowned New York dealer who acquired the figure in 1931 and subsequently sold it to Alastair and Edith Martin. It seems this is an unprovenanced artifact – looted many years before laws went into effect attempting to curtail the sale and importation of illegally excavated antiquities. While I expect various museums to be bidding on this incredible object, it will probably end up on the hands of a private collector and disappear from view forever. What a shame. Better that, though, than the piece being “repatriated” to Iraq, where it would either be destroyed by Islamic extremist thugs who have no appreciation for history or art (they are ignorant barbarians) or promptly stolen from whatever museum it was put into! At least the sale proceeds will go to some positive benefit through the charitable foundation. I wish Mr. Martin had decided to donate this piece to the Brooklyn Museum, though. It's been home there for 60 years. Better that, though, than the piece being “repatriated” to Iraq, where it would either be destroyed by Islamic extremist thugs who have no appreciation for history or art (they are ignorant barbarians) or promptly stolen from whatever museum it was put into! This is so offensive! Iraq is not Afghanistan you know? Yes, I know it's offensive, but it's what I see. Iraq under S. Hussein was not Afghanistan (or Iran) but what has happened since the the U.S. invasion? In attempting to seize power and impose their religious beliefs on the country or just out of sheer hatred, Iraqi factions are killing each other, including each other's women and children. This is the height of barbarity. People point their fingers at the American "invaders" and call us barbarians, but we're not sending suicide bombers into funerals and blowing up mourners, are we, or hiding nail-packed bombs under the skirts of women to kill innocent people. Who was it who looted the Iraqi National Museum - that wasn't Americans either. It has been Americans who have led the search to retrieve national archaeological treasures back to that museum, much to my dismay. They'll be safer in the hands of private collectors than in Iraq! I suggest before throwing shoes at Americans the Iraqis take a good long hard look at themselves, and stop blaming their current problems on the "invaders." The problems won't go away when the Americans go away and we will go away, despite the hypocritical stance of the Iraqi government that says one thing in public (go away, we can handle it) but wants another in private (Americans, do NOT go away, we need you here to stay in power). I've had enough of the uncivilized behavior of Iraqis and as far as I'm concerned, our soldiers can't get out of Iraq and shake its dust off their boots quickly enough. Are the "Nessie" in Loch Ness Some of These? Phillipines' Newest Grandmaster is "Just So"
We're All Just Figments of Our Own Imaginations! Dogs Are Smarter Than Humans Think! Duh! What's Really Under Constantine's Column?